Three Dalhousie students and one recent grad are starting up a sushi food truck, but only if they can navigate the legal requirements. One of the students, Josh Gummett, says they’ve been researching funding options, start-up costs and food safety regulations. “There’s a lot of things that could stop us dead,” said Gummett. Despite the maze of regulations, said Gummett the group of friends is serious about starting up the business and passionate about making sushi. They were eating a meal of homemade sushi one evening when someone piped up: “We make really good sushi,” said Dustin Johnson, another on the team. 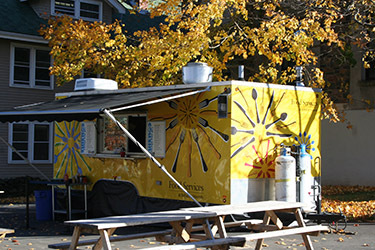 That’s when they decided to start up a food truck for summer 2013, even though none of them have a cooking background. Johnson studies mechanical engineering, Gummett studies mathematics, Sagar Jha is a biology grad and Ricky Curry takes physics and music. But the group has been having fun. They even have a name for their new business: That’s How We Roll. The group still needs funding to purchase the equipment, as well as to go through the province’s food licensing rules. They have no estimates of costs yet, except for hoping to rent a truck for “not too many thousands of dollars,” said Johnson, but they’re looking for funding and have a business student friend drawing up a business plan. There’s one hurdle they might not be able to surpass, said Johnson. “One thing we found is that there’s a limited number of places in Halifax where you can park a food truck on public property,” he said. On the peninsula, there are 19 food truck spots. They’re divvied up by either tender for five year contracts or by yearly contracts costing $915. Jennifer Watts brought this up in council over the summer. Council passed a motion to have a committee study the possibility of opening up the rules. For example, Watt says more spots could be opened up and the rules could be changed to let people sell food between 4 a.m. and 9 a.m., something that’s banned under the current bylaw. Halifax can learn a lot from cities that have booming food truck markets, she said, such as Calgary or Edmonton. “If you look across North America, it’s a sort of growing industry and really interesting things are happening,” said Watts. Either way, if a sushi truck pops up downtown, Watts said she might jump in its line. The four student sushi chefs say the truck could be coming, and would fill the lunch time rush. Ideally, Johnson said the group would like a spot on Dalhousie’s campus or downtown. The group has a lot to do, starting with getting funding and a licence, even though friends are giving them a thumb’s up.